From Summer Slide…to Reading Pride! This is a quote from a recent article in British newspaper The Guardian by Charlie Higson, author of a variety of YA fiction including the Young James Bond series. Sure, as a writer he might have a vested interest in promoting reading, but there is no denying the inherent truth of what he is saying. To get kids to read, and keep reading, particularly over the long summer months, it must be a pleasurable experience. This is definitely the point that we need to get across to children now that the sound of the school bell has faded and it seems like forever before the leaves start to turn and they’re back at their desks. Summer is for having fun, and that includes reading! Many families, teachers, and librarians worry about the summer learning slide, and with good reason. A study done by Reading Rockets found that for “116 first, second, and third graders in a school in a middle class neighborhood …the decoding skills of nearly 45% of the participants and the fluency skills of 25% declined between May and September.” Attention clearly needs to paid to reading over summer vacation if we are to combat this trend. For families who want to renew their children’s enthusiasm for reading, bilingual books can add a new dimension. For families who speak a language other than English at home, bilingual books can be a comforting way to read in their home language while simultaneously building their English skills over the summer. Start with an old favorite. 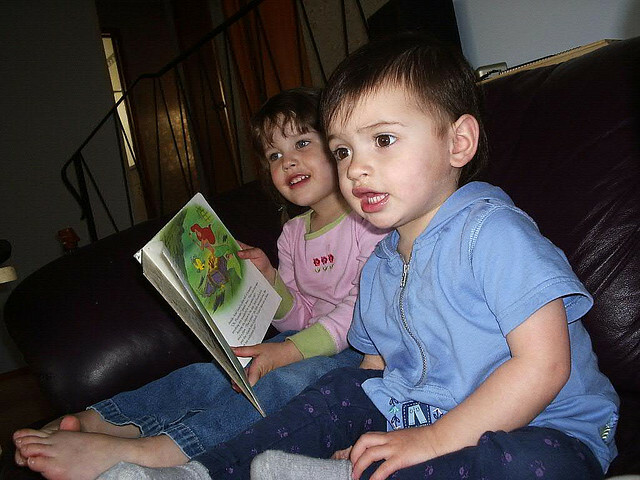 A great access point for bilingual reading is a book your child already knows and loves. If he or she is a fan of Goldilocks and the Three Bears, reading it in English and then in French will make the new language seem less intimidating. 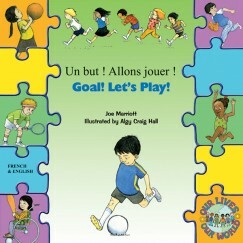 Kids will enjoy matching up the French vocabulary with the pictures and English words they already know! There are also a variety of folktales and stories from around the world available in bilingual editions (English and another language text on the same page), so children who speak a different home language can also find stories that are familiar to them. A group of parents who want to encourage their children to become bilingual readers could find a set of books to swap throughout the summer, so no-one gets bored! Become the star of your book. 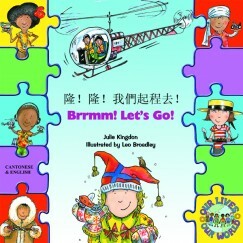 Bring your bilingual story to life by getting kids to act it out using words from the less familiar language. Not only is this fun, but the kinaesthetic element will help embed their new vocabulary. The creativity and freedom involved in this activity will go a long way towards helping children understand that reading is enjoyable and reading a new language is even more fun when you practice it together! Make a scene! Why not try using cardboard and found objects to recreate a scene that you see in the bilingual book you’re reading? 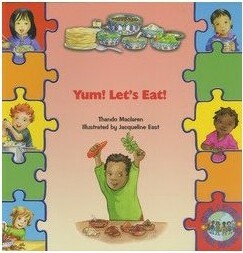 The kids can go on a hunt to gather what they need and then label the scene in both languages used in the book. Talk it out. Start your own mini-book group, even with your pre-schoolers! This would be especially useful for parents who are trying to encourage their children to speak English alongside a different home language. 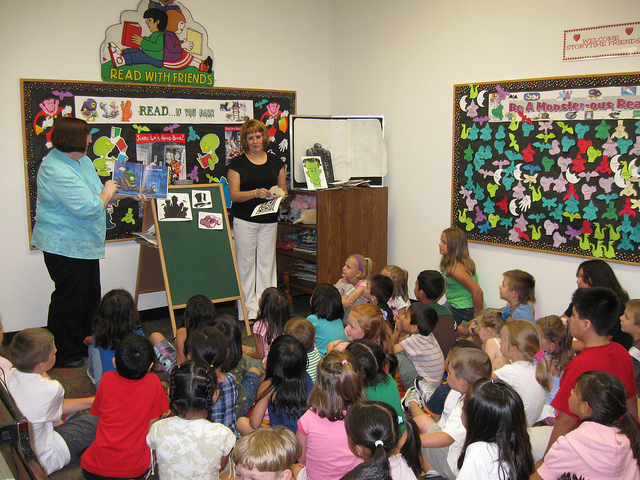 At school, children are used to discussing books. The question-and-answer structure will be familiar to them and therefore allow them to feel more comfortable and take more risks speaking their new language. 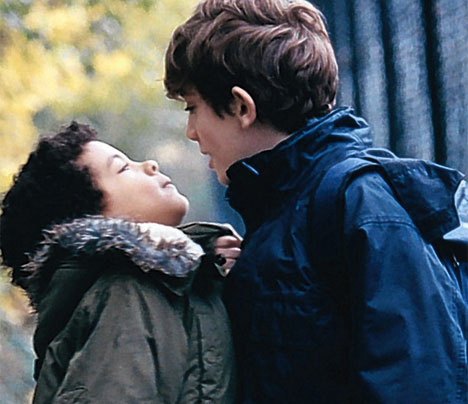 Simple discussions about feelings and plot are great tools to help embed new vocabulary: “How does the explorer feel about the animals at the end of the book? What has changed?” “What were your favorite plants that you saw in the drawings?” See if you can get your children to answer in both languages. They’ll feel more involved in what they’ve read and excited to continue their literary journey! Let a librarian help. Kristina Robertson from colorincolorado.org, a website dedicated to helping the families and educators of English/Dual Language Learners, writes, “Libraries offer all kinds of resources and opportunities to ELLs and their families, but many families may not know about the kinds of services and programs that libraries offer.” Well, summer is the time to check it out! Head to your local library and see what bilingual resources they have available. Many libraries also hold summer reading challenges (see the next tip) which can easily be adapted to support bilingual reading. Colorin Colorado provides a useful list of links to different programs in major cities – if yours isn’t on here, a quick search on the internet may also provide results. Are you a librarian? For you, summer is a great time to reach out to the community and welcome ELLs into your stacks. As Robertson writes, many families are unaware of the great summer reading programs and bilingual resources you offer – so get some flyers translated and start sticking them up around town! Challenge yourself! Embrace your child’s competitive spirit and let them enter the Scholastic Summer Challenge. Kids log minutes and see “how far round the world” they can read – as a parent, you could log double for bilingual books as they’ve technically read them twice! Banish “Are we there yet?”s. Ah, the long car ride- a breeding ground for “I’m boooored!”s or, worse, long silences broken only by the tapping of little fingers on a Nintendo DS! But it doesn’t have to be this way: find a bilingual children’s book on cd, or record your own as a podcast, and bring it with you on your way to Grandma’s to keep the kids entertained and prevent the dreaded summer learning slump. 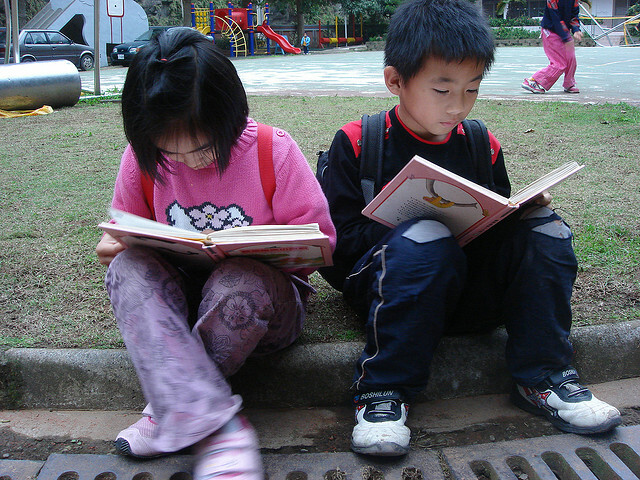 Summer is such a perfect opportunity to show kids how much fun bilingual reading can be. How are you planning to use bilingual books to prepare your kids for the exciting year ahead at school? Do you remember dreading group projects when you were in school? Inevitably, our teacher would pair us up with someone we hardly knew and begrudgingly we participated in the activity. Of course, by the end of the project we knew our classmate better than ever while having had a wonderful time. For English Language Learners, cooperative learning activities have been shown to help improve academic performance as well as increase motivation, strengthen self-esteem, encourage student bonding and promote literacy skills. Of course, there is always the fear that a shy student won’t participate fully when paired with more outgoing students. To solve this, teachers can create more equitable groupings or create activities that encourage participation from each student individually. 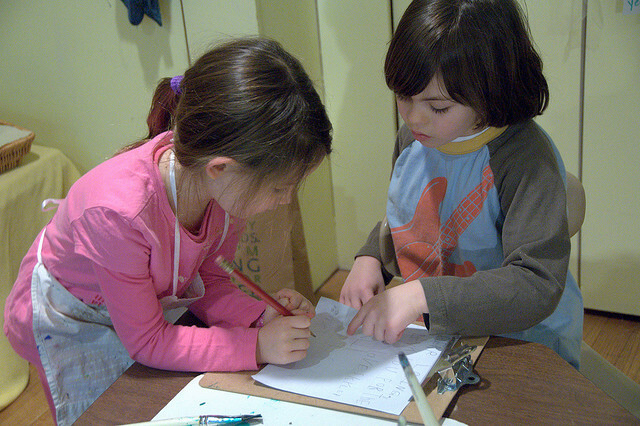 When paired well, a student who has stronger language skills can help a student with weaker language skills improve through cooperative learning activities. As we all know, reading comprehension is essential in today’s world. It is necessary for mastering subjects in school, working at jobs, and deciphering written communications. Without it, we might be able to pronounce words on the page but would not be able to make sense of what the words mean when put together. Reading comprehension demands that we create images and connections in our head based on the combination of words that we are reading. The more familiar we are with the words on the page and how they apply to what we have already learned or experienced in our lives, the better will be our comprehension. For English Language Learners (ELLs), this is especially challenging. Most ELLs do not have a strong English vocabulary from which to pull, so it is important that they are presented with text that includes a lot of context. Pictures, short sentences, words that are repeated again and again can be especially helpful. If recognizing individual words is difficult, it will interfere with a student’s overall ability to comprehend what is being read.